…so nix the Christmas idea, keep feeding the pigs until they hit say 80 kilos in weight. It was not to be, just as they were rounding say 70 kilos in February, they got sick and died. We don’t use antibiotics nor inject our pigs with anything else, so we aren’t sure what did them in, but suffice it say that experiment didn’t end well. Homegrown, organic, happy hams were not to be. Then a week later, passing by S&R’s chilled butchery section, I spied whole hams hanging on a rack. Could it be this easy? Yup, just head to the grocery and buy the darned thing. 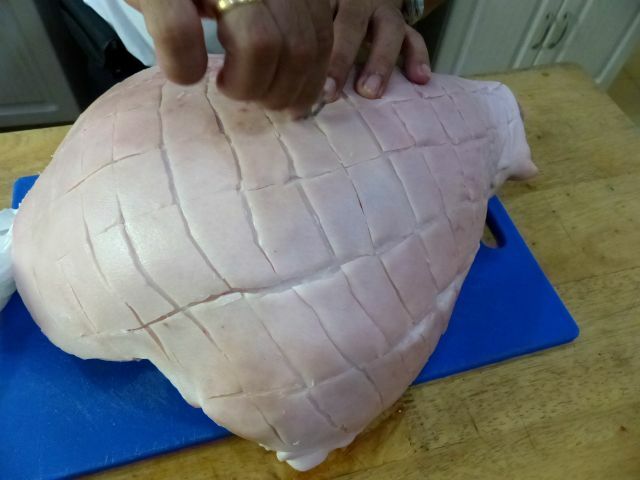 :) I picked out a ham that was roughly 10 kilos with hoof, and they removed the hoof for me, and back at home, I removed the aitch bone myself to end up with a perfectly good looking ham, albeit piggery raised on feed and steroids perhaps. It certainly looked like a ham. For this recipe I merged elements of at least two recipes, one from a Bon Appetit magazine article for a fresh ham I wrote about here, but adjusted a LOT due to the lack of salt in the last one I made, with some prague powder for the classic pink color and preservation effects, as well as a mustard and brown sugar glaze that is usually applied to an aged southern ham… Think of this as a snazzy roast leg of pork. 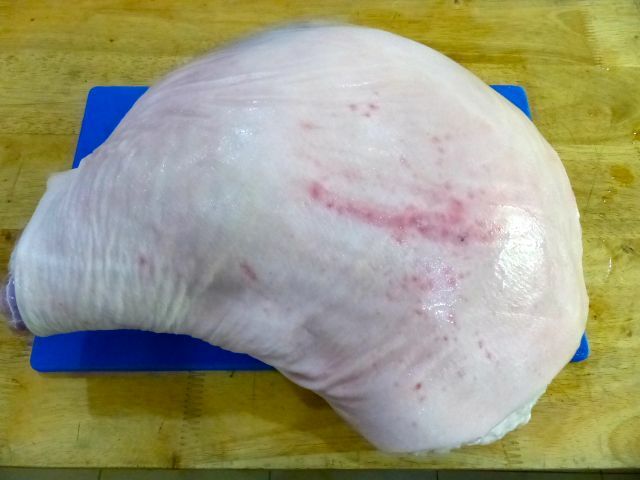 It is a fresh ham, not a long-cured salty dry ham. There is a big difference so you need to have the right expectations. The first step was to score the skin through the fat but not to the meat. This was a minor pain in the @!#$!. The sharpest knife in the kitchen, and I sharpened it just for this task, struggled to make a nice clean slice through the skin. We tried an exacto knife and that didn’t do much better. …I also added lots of orange zest which is an essential ingredient of this particular version of ham I think. The orange rind really gave this a distinctive aroma. 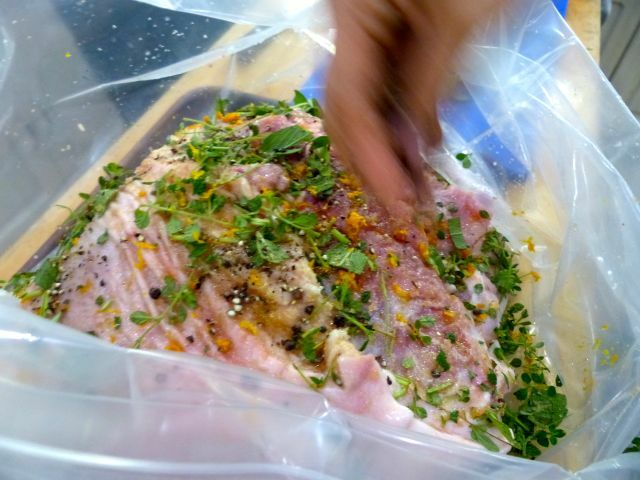 Seal the plastic bag, removing most of the air, and let this ham marinate in your fridge for at least 4 days, preferably 5-6 days, turning the bag over twice a day to ensure that the marinade is evenly absorbed. After 4 days, we removed the ham from the plastic bag, removed all the marinade ingredients and placed it on a rack in a baking sheet. It had a nice pink color to it (particularly the exposed meat, rather than the skin) and I was very happy with the appearance of the ham at this point. Season the skin and meat with a bit more salt and pepper and it is now ready for the oven. 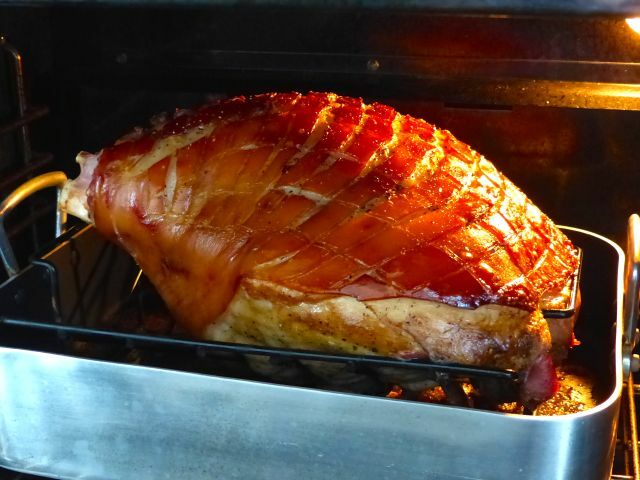 We fired up the oven to 450F and placed the ham in it for 30 minutes to get to this color. Turn the oven down to say 330F and let it cook some 3.5-4.0 hours more until a thermometer inserted into the thickest part of the meat registers say 145F. 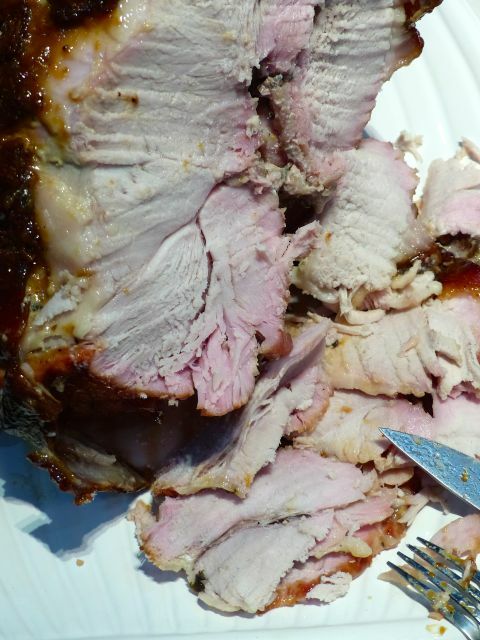 Some recipes suggest you pull it out sooner at say 140F, and not to worry about slightly pink meat near the bone as it has already reached a safe temperature, but for most pinoy guests, including our crew, the slightly pink pork gives them the hibbie-jibbies, so cook it to say 145 or 150F on your meat thermometer. It will cook further when you remove it and internal temps will rise to 160F, which should take care of the pink meat, though it will dry out a little more. 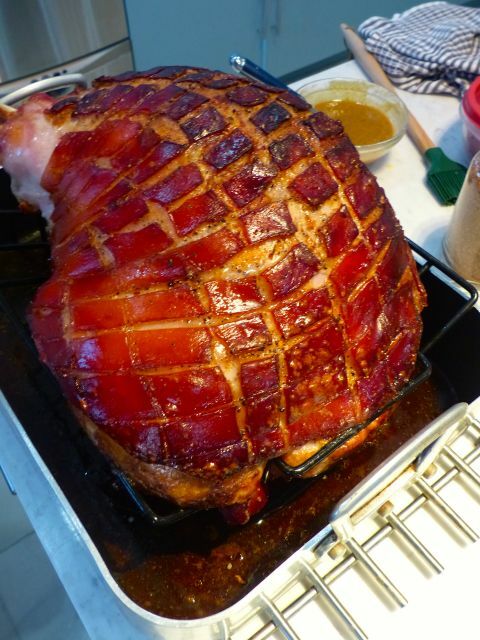 Let the ham rest for at least 30 minutes before you carve and eat it. You can go straight ahead and eat this as is. 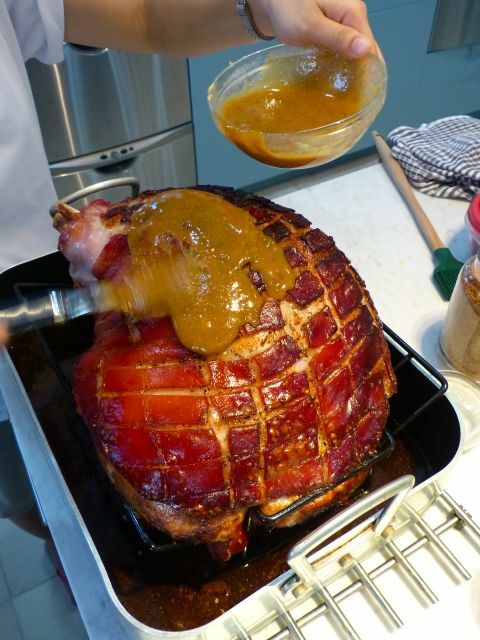 But I decided to add a glaze of brown sugar, dijon mustard and a touch of wine vinegar, which we brushed all over and put the ham back in the oven to caramelize the mixture… This is for added flavor and texture. Doesn’t this get your salivary glands going on overdrive? 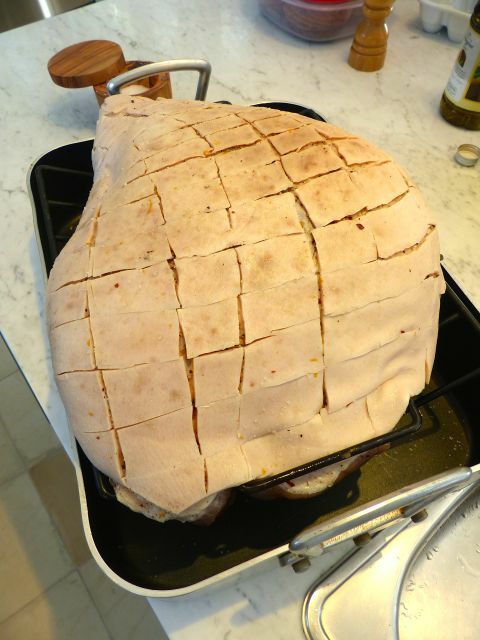 The ham looked terrific at this point, and I had great hopes for the final product. It was looking pretty darned good. 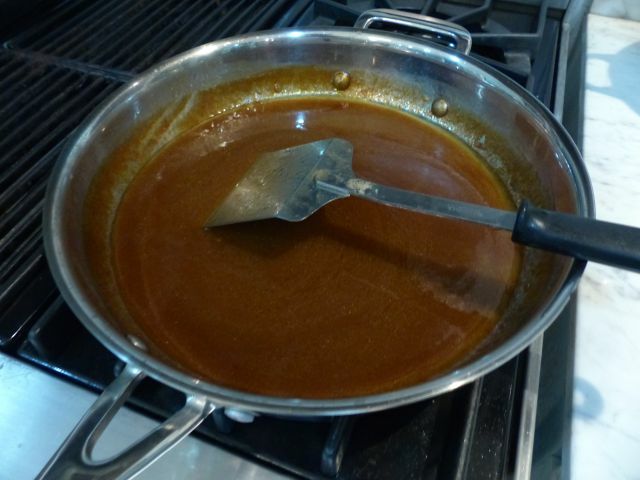 And we made a gravy from the pan drippings, some fresh orange juice and some cornstarch dissolved in water. 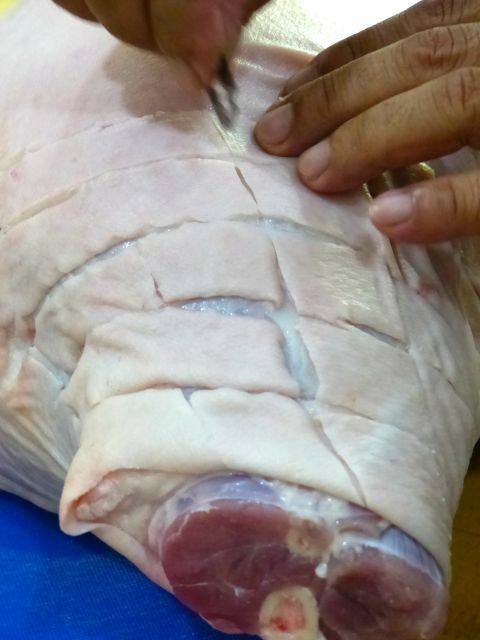 Slicing into the meat, we came across this superficial ring of pink near exposed areas of meat. Clearly, I hadn’t used enough prague powder and it hadn’t had enough time to work it’s way into the meat to make it a uniform pink. But never mind, that experiment wasn’t essential and the ham still tasted great. It looks dry in this photo but actually it was quite moist, and somewhere between a fresh roast and a classic southern ham (soaked and boiled and baked) in terms of moisture. 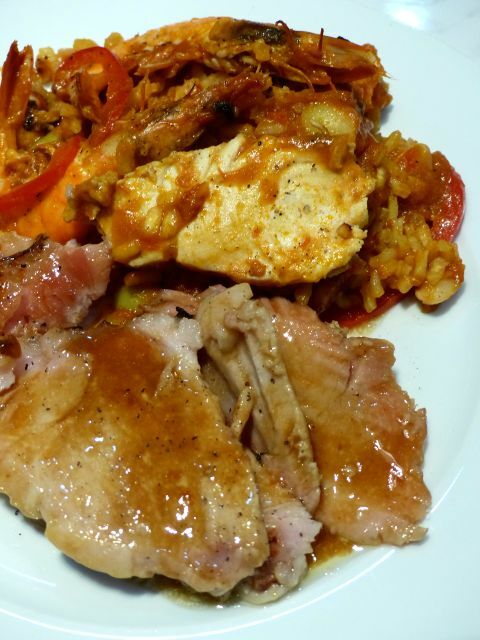 With some of the gravy, along with a seafood paella, it made for a very festive and delicious pre-Easter celebratory meal. We cooked this at the beach a couple of days ago. If I were to improve on this experience, I would try and inject the prague powder, water and salt solution into the meat with a big needle so that the color might even out. I would also leave this another day or two in the fridge before cooking it. 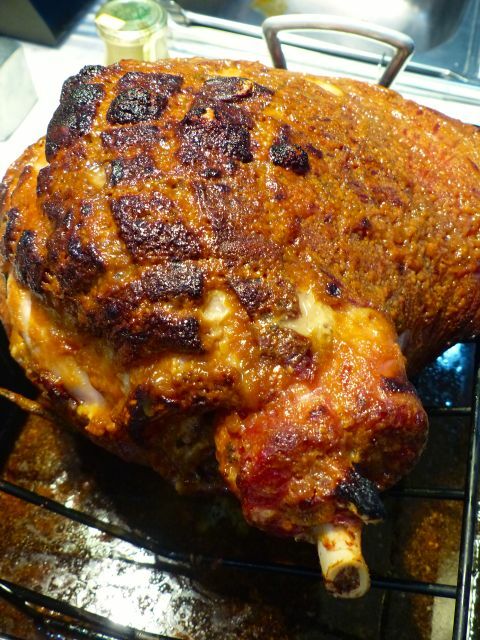 If you haven’t made a fresh ham before, I highly recommend it. 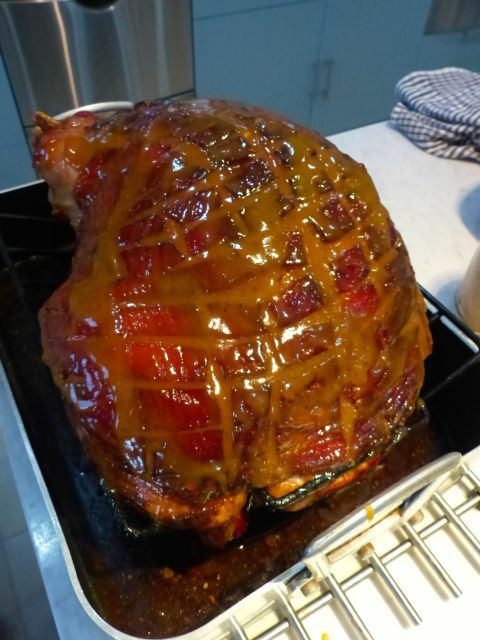 For a total expense of say PHP2,200, this 6-7 kilo cooked ham excluding the bone and shrinkage, could easily feed a crowd of 20+, and you will have leftovers to boot. We have heated up some of the leftovers and they make terrific fillings for sandwiches or if you are a rice fiend like me, it goes great fried and served with steamed rice! Happy Easter to you all! Happy Easter MM and troop! I have long wanted to do that but have visions of glowing in the dark from the Prague powder. My mom, usually cooks her own ham during Christmas and injects a solution of salt, sugar and prague powder into the meat to get an even brine. After like 4-5 days depending on the size of the meat she then boils it down on a beer, brown sugar, bayleaf, peppercorn mixture. We then heat it up on the oven with some glaze and the darn things tastes like the store brought ham, albeit 1/3 the price. What a wonderful recipe! I’ll be sure to try it this coming Christmas. Have a wonderful Easter MM and family! 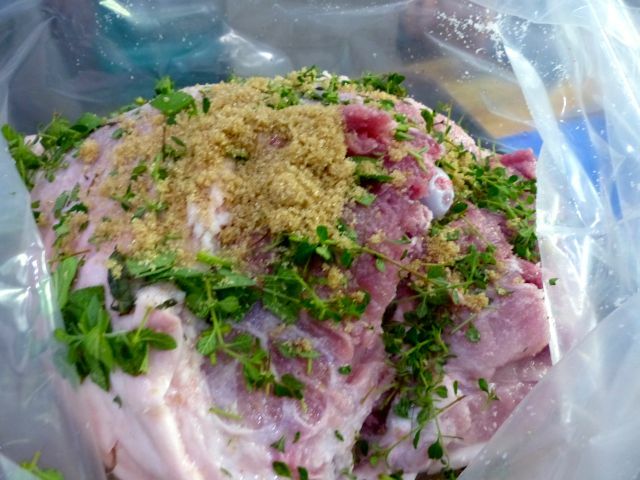 Allow 2 weeks to brine refrigerated. 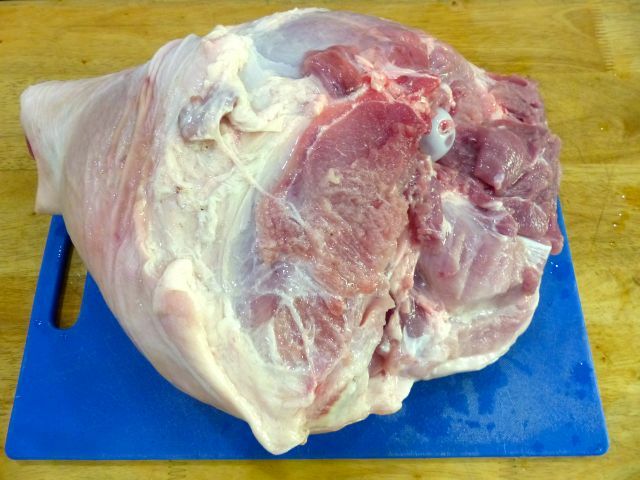 Bring all marinade ingredients to a good boil then cool down before submerging raw pork leg. Fresh herbs are great carriers of bacteria, botulins, etc. Eats up precious refrigerator space unless you’re in Sweden for the holidays and can just leave it in your garage. 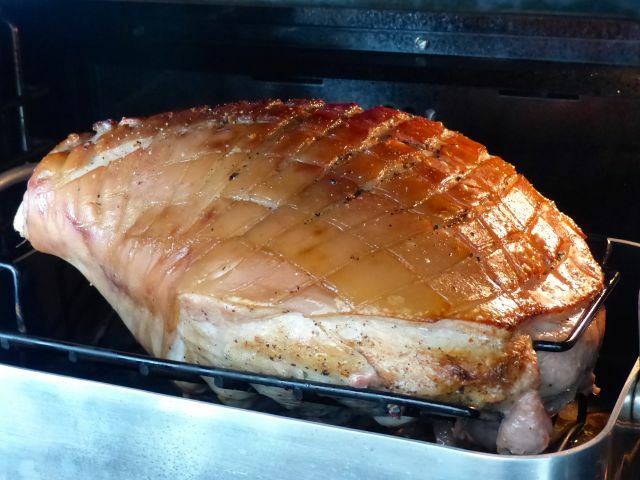 You might want to boil it like a country ham before glazing with mustard and fresh bread crumbs. I used to buy one already marinated from Schaller and Webber. I salute you for trying to do it vertically, from raising the pig up. After 40 years of making Easter dinner we are going out with daughter and son-in-law. A trend I hope, or the end of an era? Wow, really looks good just looking at it. Wish I could do this, but nobody in the family (except me) eats pork anymore. Maybe I can do with a smaller portion. Looking pretty darned good alright – – I bet it taste good too – – kagutom. HAPPY EASTER MM family and crew! Sorry to hear about the pampered piggies, but you might have killed them softly by sanitizing them too much removing the protective bacteria. Perhaps the animals rolling in the dirt is for a good reason. @Connie C: thanks for the link…. very interesting article! Connie, the “baths” are literally water baths to keep them cool in the summer heat, not literal baths with soap and shampoo… :) Trust me, they were not in “sanitized” conditions… :) And we very rarely lose a pig from our normal operations unless it likely arrived sickly to begin with. Footloose, HAHAHAHA! Of course YOU would STUMBLE upon that treasure trove. Too funny. As for lohua, which I am not familiar with but assume is a noodle dish, do you think it could have started during World War II when a LOT of the “Japanese” soldiers here were actually Korean “subcontractors” missing a taste of home? which btw is now the first link you get when you google lohua. I went back to MM’s special post on lohua for Footloose ( welcome back and thanks for the Lapham’s Quarterly link, etc) and got another taste of a post among many that incites commenters’ enthusiasm ( bettyQ’s for one, I can almost feel her running out of breath with her ideas)), even stirs memories of a happy childhood. Need I say 10 years of this blog’s longevity is a no mean feat? Comment on #11 Footloose’s link…is that from the seed of man…without the rest of him? A very funny picture indeed. Because of that “ampaw” post, I challenged my hipag to locate that store, and she did. She bought about 500.00 pesos worh of almost everything, and when I arrived 3 days after, nilantakan ko lahat yon. Oops, nakikain ang ilan sa mga kasama ko we travelled to my destination in Quezon Province. Some of the young’ings didn’t even know some of the products and another adult didn’t know that store still existed. I fear early onset Alzheimers… duh. Yes, of course that’s what lohua is… I couldn’t google when I replied to you (dopey Philippine Airlines Mabuhay lounge doesn’t seem to allow surfing but allowed emails and direct site access)… and egads, Connie, you just reminded me to check another milestone and I let it pass unnoticed. Post on that up next! I am so happy you guys keep me on my toes, I can’t even remember things I have already written about! MM: I was just thinking, you are so very good with anniversaries. Is it possible you missed your 10th blogging anniversary? I even went back to your first post in the archives which is the one on Dalandan September 1, 2004 . It had no indication whether that was your maiden post, but I counted, using that as my time reference. If indeed it was, then you are running on your…… OMG, 11th year!!! Belated 10th anniversary Congratulations MM and to all MARKETMANILA.COM netizens who have faithfully followed and commented on this blog! OMG, Footloose! Where do you ever come across those things! I HAVE TO PLANT ONE OF THOSE!!!! now am on the hunt for seeds! Doc, you are absolutely correct! I am going to really hunt for those seeds and that will keep me busy and out of breath! Speaking of thngs that get me going, am on my toes with new found discovery food related of course. Hope MM succeeds with his experiment! if he succeeds, my antenna says he will be the very first one to introduce it back home! Another one that kept me going was BABY PALMIERS! I have succeeded recently perfecting baby palmiers! Forget wht you read on the web…the recipes shared by those people on the net DOES NOT WORK! They do not share tricks of the trade that would make them look and taste like the one you buy in Paris! So if you can get prepared butter puff pastry sheets, let me know Doc! Footloose, if you want, send me an email and I will tell you how to make them whch I think you will enjoy with your Kape Barako! I know you can get the puff pastry sheets at Walmart…frozen section beside the eggo waffles! Hi betty Q: Now you got me thinking about baby palmiers….so that’s what they are called. I did not know what they were until now. Looks really delicious. Just one note, please don’t use the black garbage bags as a container that will directly touch food. These things are made with recycled plastics and may contain toxic chemicals which washing alone won’t eliminate. Learned this from a local manufacturer of these bags. 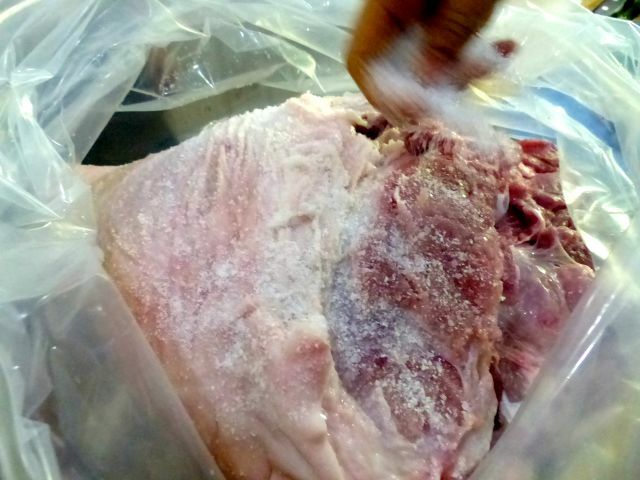 Clear plastic bags that are food safe can be bought cheaply, maybe 10 to 20 pesos for the size that’ll fit that ham. Boopsie, not sure why your message doesn’t show up, but was that the question on bacon? I have a post on homemade bacon, here. The recipe I used was from Saveur, here. Monty, thanks for that advice.